HUD - Heads up Display System from the DarkWynter project - this is a self contained DLL that users can add to their own XNA games with minimul coding before having a fully functioning HUD. Written in C#. Sample in-game HUD using this code. 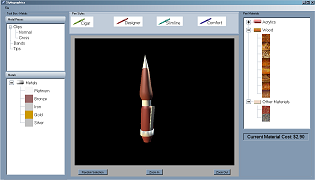 HUD Demo Files - Demo project of the Heads up Display System from the DarkWynter project - requires XNA 3.0 or 2.0, DirectX SDK, and Microsoft Visual C# Express Edition 2008 or 2005 to run. Sample dialogue run on the HUD using this code. Stylographics - A prototype for Pen Turners (people who custom make pens) - allows Pen Turners to quickly visualize the pen styles and materials in 3D, without having to make the pen first. The models and textures are loaded and applied during run time. Written in C#. Click on the image for a larger view (opens in a new window). Seam Carver - Based on the Content Aware Image Resizing algorithm **, the program takes an image and a size and dynamically resizes the image without losing content. Written in MATLAB. Click on the image for a larger view. 2D to 3D Converter - This project creates a 3D object from 2D images (of primitives). 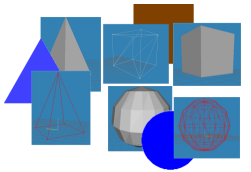 The 3D object maintains the same porportions as the original primitive and also outputs in a .obj format, which can then be used in a 3D graphics program that supports the format. Written in MATLAB. Sameple results from using the program. The models are displayed with Milkshape. DSGraph - Part of a graphing program - this is the graph implementation along with an implementation of the Bellman Ford algorithm. Written in C#. Sorting - This is a program using four sorts (QuickSort, Insertion Sort, Merge Sort, and Heap Sort) on a randomly seeded array. Written in C#. 3D Solar System - This is part of a program that I wrote for graphics. Using OpenGL and C++, this is a 3D Solar System complete with lighting and moving planets. Binary Tree - This is part of my binary tree program that I wrote, and then modified later, for graphics. Written in C++. Neverish Dictionary - This is part of my dictionary program, where I wrote a custom linked list class and did a radix sort on the data. Written in Java. Divider Test - This program is designed to convert numbers from a file to binary, divide the numbers by repeated addition of two's compliment, and convert back to decimal. Written in Java.